It's very easy to write about Hove. Mention gentility once or twice, recycle the old 'Hove actually' anecdote and add a paragraph about the relationship with Brighton, not forgetting to use the word 'louche' to describe the latter. If space permits, throw in Keith Waterhouse's 'looks like a town helping the police with their enquiries' quotation about Brighton and your work is more or less done. Running in Hove is another matter altogether. The Hove Prom 10k, last attempted by me in 2009, is fast and flat, the antithesis of last Sunday's Hellingly 10k. The weather too was cool and overcast, unlike last Sunday's heat. One might expect the field in a race in Hove to be made up of characters from a Patrick Hamilton novel, ex-Indian Army majors, drunken bank clerks, single women of a certain age, callous vamps and their fascist boyfriends, all competing against one another in a fug of alcohol and sexual frustration. In fact the runners are normal, though a lot of the young men looked alarmingly fit and fast. As I walked to the start I chatted, first to a young man who had parked his car at the turning point, rather than at the start, then to an older runner, who was spectating for the day, ill-health having forced him to withdraw. Get well soon, Dave. Dave and I threw a ball for an engagingly friendly dog walking on the prom, (whose owner looked disconcertingly familiar, but I lacked the conviction to greet her) and before we knew it we were at the start. I barley had time to leave my bag before being urged by marshals to the start. 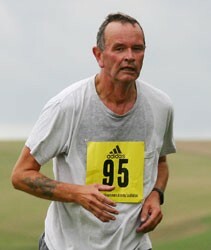 I and one of the older Striders took up positions towards Shoreham, at the back of the pack. We had no wish to be trampled underfoot by keener, younger runners. The race is a two-lap affair, running eastwards at first, diverting inland for a stretch, then returning to the Prom past the King Alfred and turning at about 2.5k, and again 7.5k, to run back to a beacon by the lagoon. As we passed the houses on the first inland point, a lady with a megaphone encouraged us from one of the balconies of the flats on the other side of the road. It was hard to make out what she was saying, but it seemed to have something to do with promoting gender rivalry between male and female runners. For the first lap, I was going fairly well. The second was hard. I saw a man ahead of me, younger than me, and manifestly unfit, and decided to make it my aim to beat him. Do not judge by appearances, for I never did. As at Hellingly, my team captain passed me a little after half-way, though older than me and running with an injury, and once more, though I thought I'd try to keep up with him this time, he outpaced me to finish at least a minute in front. The official times aren't out yet, but I made my time 58:07, which I am happy with. It is under an hour, and five minutes faster than last Sunday. I went off too fast, as I always do. The knee was not too painful; I think my slowness in the second half was more due to unfitness than any fundamental problem. Now I must decided whether to go to Barns Green for half marathon in two weeks time, or leave that and go straight to the Lewes Downhill 10 mile in three weeks. I shall do a long run next Sunday and base my decision on that. Today I ran my first race since the Glasgow injury. It was hard and hilly, but I finished. This is one of the Sussex Grand Prix races, and one I had never done before; as I have tried this season to do races that were new to me, it fitted perfectly. But I only returned to running two weeks ago. Would that prove enough? The route is the quintessence of the English countryside, roads and lanes that run by hedges and through woods. It is all on road, and the hedges hide the views, but nevertheless it was glorious. I and a fellow-runner exclaimed in delight when one section took us from the glare of the sun into cool shade, smelling of autumn. At the start, talking to fellow Striders, warnings were uttered about the hills. At first the route is flat and then descends slightly, but then begins a steady climb and is uphill until the 5k mark. I managed well, and didn't have to stop to walk, unlike others. The Garmin shows only 100m of ascents, so the hills are not terrible; I suppose it is the continuous ascent that puts some runners off. My knee didn't hurt and though my breathing was perhaps not all it should have been, I felt well. After half-way, the route eases a little, and some welcome water freshened me. But by 7 or 8k, I was really struggling. Another runner encouraged me and, following his pace, we passed a farm offering a full English breakfast, and another selling horse manure, he entertained me with thoughts of how one's running technique might have to adapt if carrying a sack. I let him go on and others overtook me. By now it was really hard and as we arrived at Hellingly village, I wondered if I could finish. I kept going, to finish in 1:04:35. I must have looked as if I was in trouble, as another runner, someone I vaguely recognised from the Sussex Grand Prix circuit, asked me if I was all right, and said he had seen me struggling. And perhaps I was close to fainting, for I felt much as I felt once when, as a boy, I was on a walking holiday in the Peak District and collapsed in a swoon. Some liquid restored me. Thus with a 10k under my belt, I can prepare for another next weekend, the Hove Prom 10k. I hope to be inside the hour this time. So far, so good. I ran 6.5 miles, in mist and drizzle, so I know I can cover the distance. I had occasional knee twinges, but nothing to suggest that a 10k is beyond me, so I think the Hellingly 10k next Sunday is possible. (Note to non- Sussex readers: it's pronounced Helling-lie). have tried to find out how hilly it is; there are contradictory views of the difficulty of the hills here and there around the web, but people seem to agree that the harder hills are in the first 5k. The following Sunday will be the Hove Prom 10k, which is flat and fast. The toughest target comes at the end of the month, the Barns Green half. I haven't run a half-marathon since February, long before my injury, and I have one free Sunday for a long run, but I think it will be all right. From tomorrow, I shall abstain from intoxicating liqours.